Just finished installing Mojave, and it seems to be running OK! As usual time will tell, but at the moment all seems to be hunky dory! Brave man. I have decided to wait a few weeks, mostly because of software that is likely to no longer work on Mojave and of course the inevitable bugs. I did some reading after posting this and it seems there were quite a few people having problems just getting the upgrade to run. I think I will also wait a while. I’ve always updated my iMacs asap, never had any problems so far! That said there are bound to be the odd bug or tweak to be made, they will come! I used to upgrade early, but ever since Steve jobs died there has been a higher incidence of problems with the releases. Especially when you're using a lot of older hardware like me. I was really miffed when they stopped supporting the original airport Express. Plus I also had my first Wacom tablet rendered useless after an update because Wacom don't update drivers for older models at an acceptable rate of knots. But glad to hear it is working out for you, Mike. Keep us posted. I once had a Wacom tablet, what a load of crap that was! I updated yesterday, with the same experience as Mike. I do not like dark mode at all. Agreed Anthony, I’m also not a fan of the dark mode! I just installed it on my MacBook Pro today. There was a bit of a hiccup after the installation. It was asking me if I wanted to send analytics to Apple and developers. I ticked the boxes to approve this and then the machine just froze. Sat like that for about 10 minutes before I forced a restart. Then it let me login. The next problem presented itself immediately. I use a program called Synergy which lets me share the mouse and keyboard from my iMac on the MBP. This program is invaluable to me as it lets me copy and paste between computers without any issues. The client configuration is on the MBP and the server is on the iMac, but it wouldn't work as it normally does. I had a look at their support forums and others were havign the same problem. Fortunately somebody there has figured out what the issue is and after following the steps they did I have it working again. Phew! I quite like the dark look! I'll wait until next week to see if I hit any other gotchas before I upgrade the iMac. Dreading that because it's really slow compared to the MBP (which runs an SSD). Been running Mojave since release day without any problems. The only thing I had to do is update the Wacom driver. I've had a few unexplained incidents on the MacBook Pro. Every now and then the wifi connection will drop, which causes me untold grief because that machine is my media library and I use it to stream from, as well as a few other things. I might upgrade the iMac soon, but my calendar is so chock full of shoots this week and also into next that I can't afford to run the risk of something going wrong and then not being able to process my work. I've just upgraded and still getting to learn what is going on. One thing that I've found that I don't like it the integration with various social media (in particular Facebook and Flickr) has gone. You can no longer jus right click on a picture and share it to such sites. I have found a monumental stuff-up by Apple in the new version of Mac Mail for Mojave. Can you believe that they removed the stationery feature entirely? And unless you downgrade back to your previous OS there is no way of getting it back. Why was this useful? If you send the same email out regularly (which I do to confirm photography appointments) you could save your template as stationery, then with a single click pre-populate a new message with the template. I understand that Fuji users are having trouble with Mojave not recognising RAW files! My mu-43 raw files are fine! 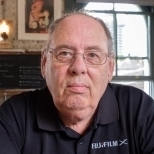 It causes no difficulty with RAW files for me, either from the Fuji XT-1 or the Leica Q.
I have not tried it with files from the Leica M-10, since I don't own that camera yet.